I've been wondering for some time when Burberry was going to hop on the limited edition train. Apparently, the time is now. For this summer, the company released a well-edited collection of four Lip Mists (which I didn't purchase) and one limited edition highlighter palette, Sheer Summer Glow. I've been eyeing this ever since I saw the press release almost two months ago, and ordered it as soon as it became available on Nordstrom online (thanks to the heads up from Danielle of Bloomin' Beauty Blog). 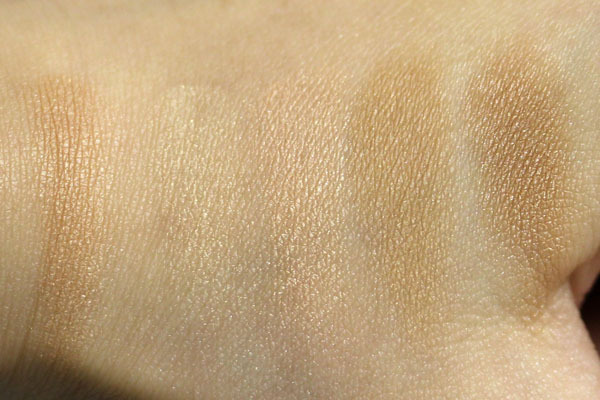 The palette consists of four shades: a cream, light pink, honey brown, and dark brown. They all contain muted shimmer. When blended, the result is a light bronze. The palette has a strong scent - it is the same one they use in all Burberry powders, but it's a lot stronger in this one. While it doesn't bother me, it might be too strong for those with sensitive noses. The fragrance disappears on your skin a few moments after application. When swirled together with a brush, the palette works more like a summer highlighter than a bronzer. In the picture below, I applied it all over my face, with targeted application on the cheeks and jawline. 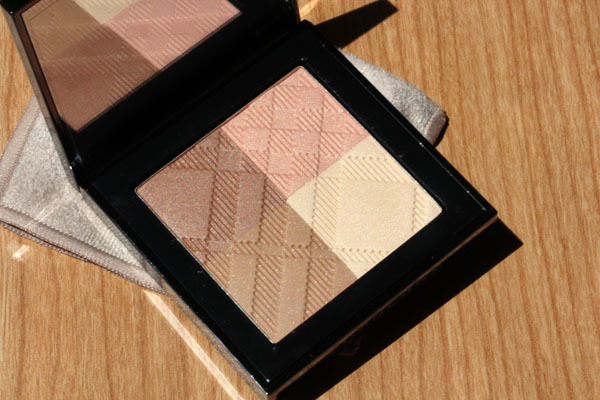 Burberry Sheer Summer Glow provides a light veil of color to "hone" the face. That said, if you really want to, you can get more pigment out of the palette. 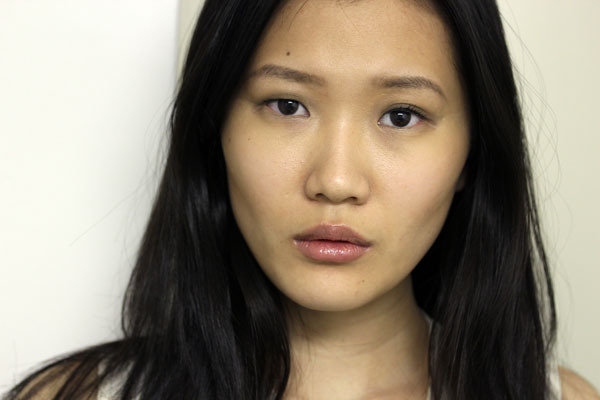 As you all know, I am a fiend about cheekbones, so contouring is a huge step in my routine. 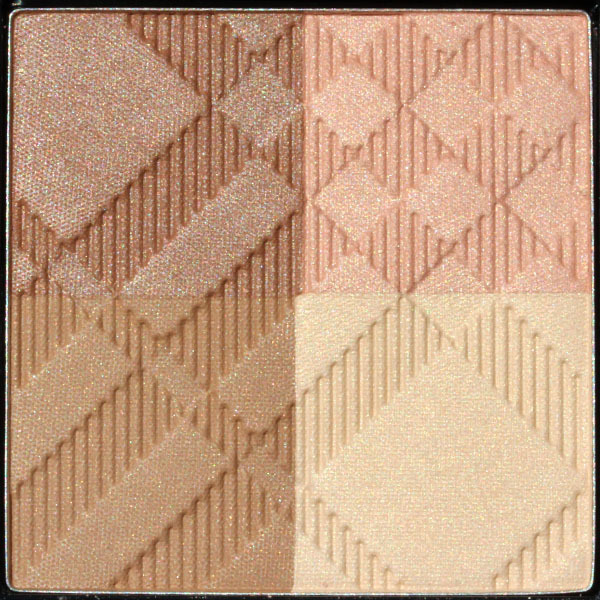 I wanted to know if I could use Sheer Summer Glow for that purpose, so I used my contouring brush (Hakuhodo E0108) and swept it across the two darker shades of the palette and applied it on my face. Worked like a charm! Will this replace my go-to contour shade Burberry Earthy Blush? Probably not. But this is a fantastic piece for summer that you'll be able to use into the winter months to give depth to your face. Burberry powders are some of the softest I've ever had the pleasure of trying. If the shades in Sheer Summer Glow are to your liking, I promise you won't regret getting this. Burberry 'Sheer Summer Glow' Natural Highlighting Compact is a limited edition item that retails for $50 and is available at Burberry counters nationwide. I purchased mine from nordstrom.com. Aargh people, stop tempting me! I already! have a million things on my wish list and way too many bronzers to ever finish! Love what this does to your cheekbones. Definitely very defined! As beautiful as hightlighters are, I just can't get that into them, as least not enough to drop a lot of dough on it. This is a gorgeous palette though and I love the way you used it as a bronzer. I wouldn't be able to pull off a shimmery bronzer, but it looks beautiful on you! OUCH THEM CHEEKZ THEM CHEEKZ!!! Gorgeous on you!! I can hardly wait for mine! this is seriously so pretty! and you are absolutely gorgeous btw! I don't have any Burberry items...and after seeing this, I'm totally tempted to try this. However, due to the price tag, I want to make sure that I'm going to use this. Just wondering, does the pink show up as blush very well on your skin tone (I'm also Asian)? We're going to Hawaii in a few weeks, and if I get this, I wanted to get away with maybe not packing an extra blush. Thanks! Sunny- it's *limited edition* Burberry, Sunny! Paris- \o/ I don't think it's limited edition, though? Geeks- Sharpen those cheeks! Lol. Lesley- You should try them! Their cheek powders are lovely. Unfortunately, the pink in this palette isn't strictly a blush shade. It barely differs from my skin color :( Have fun in Hawaii! i think it looks god smack stunning on you!!!! u are all tempting me to get this!!!!!!!! but so many bronzers what to do?? Seriously I need to get this! 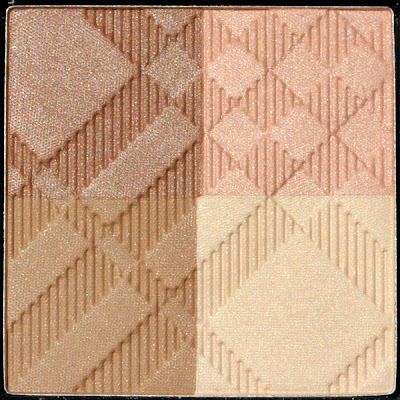 You make this looks very beautiful :) There are many great bronzers released in Summer 2012 and this is definitely one of them! I feel like I've been waiting absolutely FOREVER for mine to arrive. I'm SO super-excited! I started to get a little worried that it would be too sheer for my light to medium skin tone, but it looks fab on you and I have a similar coloring--so yay! Haha you looked gorgeous in this photo shoot! Amazing - I should check this out at Duty Free!